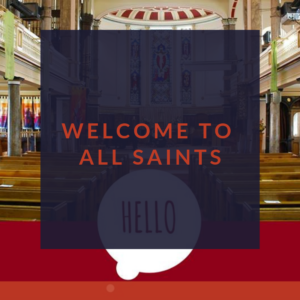 You will find at All Saints that some like to come in suits, others in more casual clothes. God is more interested in the heart than your outward appearance – and so are we! Normally we do not take an offering during a service. There is an offering plate near the entrance where anyone who wishes may place their offering or donation. During some special services we do take a collection but this will be made clear during the service. Sunday morning typically runs from 10.30 – 11:45am, the all age services are slightly shorter. Morning services are followed by tea/coffee/juice in the Parish Centre. Sunday evening services last from 6:30pm – 7.30pm, Renewal and Healing services are usually a bit longer. Midweek Communion lasts for just over half an hour. The church has full access downstairs for wheelchairs, buggies and those who use walking aids, this includes a ramp up onto the dais. There is a gentle sloping path to the main entrance. It is possible to drive right up to the entrance if you would like to be dropped off at the door, there are people available to help you to your seat if required. If you have any questions when you arrive, our wardens will be pleased to help. If you come and would like a bit more information about the Church or to be invited to one of our regular welcome meals do fill in a welcome card which you will find on your pew and hand it in on the way out. Here is a 3D scan made for the Telford 50 project – have a play to have a look around the whole church!